A Cost Segregation Study is the systematic and comprehensive analysis of all costs associated with a new construction, purchase acquisition, or remodel project. The objective of a cost segregation study is to maximize the available depreciation benefits by segregating and documenting the costs of all short life property in accordance with IRC Section 1245 and 1250, as well as tax regulations, court cases and guidelines. When preformed, a Cost Segregation Study properly identifies costs normally associated with real property and depreciated over either 27.5 years or 39 years (with a straight-line method), and correctly classifies those costs relating to personal property or land improvements with shorter recovery periods of either 5,7, or 15 years (and with accelerated methods). A Cost Segregation Study exposes costs normally hidden from view. Costs buried deep within a contractors’ monthly draw request, or even a Buyers Settlement (for acquired property) frequently go unnoticed and are placed in service with as real property. As an example; did you know that a significant portion of costs relating to the electrical contract for a construction project can be identified as tangible personal property, even when an electrical component is considered “inherently permanent”! Experience shows, an additional 25% to 65% of the electrical work preformed for a project can classified with a shorter recovery period and thereby transferring tax deductions into the early upfront years of ownership. Who can perform a Cost Segregation? In 2004, the IRS issued the Cost Segregations Audit Techniques Guide (“ATG”) to assist IRS engineers in the review and examination of cost segregation studies. The ATG describes the supporting legal framework, acceptable methodologies, and the principal elements of a quality cost segregation study. One such requirement is the “Preparation by an individual with expertise and experience”. At Pacific Cost Segregation, our team is comprised of construction engineers and CPAs. This forms the perfect blend of tax professionals necessary to maximize the benefits of an engineering based cost segregation study. Pacific Cost Segregation combines over 35 years of expertise in the cost segregation practice, with “Big 4” accounting and valuation experience. When is the best time to conduct a Cost Segregation Study? Timing of a Cost Segregation Study can vary from client to client, and from project to project. While there is no specifically set time frame to start or complete such a Study; depending on a client’s particular tax situation and tax planning strategies, as well as availability to project information, Pacific Cost Segregation works directly with clients or their CPA firms to develop a tax plan which fits their specific requirements. In general, there are many circumstances which can influence this important discussion process. At Pacific Cost Segregation, we are here to help! BEFORE the planning phases of a construction project, consulting with a cost segregation specialist can considerably increase the benefits of a Cost Segregation Study while substantially decreasing the overall fees. Working in conjunction with the construction management team, we provide a “shopping list” of assets to be isolated and tracked during construction. Additionally, it is prudent to use this service before the start of an abandonment or redevelopment project in order to maximize and document the true value write offs prior to demolition. We offer this Pre-Construction Design Service upfront, so on the backend time and money are ultimately saved. DURING the current year in which an asset is placed in service; this is the most common time a Cost Segregation Study is performed. Cost records, plans, and key personnel during development of a project or acquisition of property may still be available to provide additional insight and thereby indirectly supporting the completion of a study. Implementing a Cost Segregation Study also creates a documented “roadmap” for current year depreciation deductions. AFTER an asset has been place in service, all is not lost. A Fixed Asset Review “Retroactive Analyses” can be performed on property as far back as January 1st , 1987. Recent IRS Revenue Rulings allow a taxpayer to go back and claim a one year “catch-up” 481(a) adjustment for missed or incorrectly classified depreciation. Filing IRS form 3115 (Change In Accounting Method) eliminates the need for amending returns. Cost Segregation services may apply to? Who can benefit from a Cost Segregation Study? In short, any company with real property assets looking to defer tax liabilities can gain benefit from a Cost Segregation Study. Whether a tax payer is a large multi-location Fortune 500 company or a small “one-off” business, in either case a Cost Segregation Study is a valuable tax tool. Combining a Cost Segregation Study in conjunction with a 1031 Like-Kind Exchange is another very powerful tax-deferral strategy, although special attention must be paid to the “Relinquished Property” and the “Replacement Property” basis. As such, the impact of a 1031 Like-Kind Exchange on the Cost Segregation Study should be well thought-out so as to appropriately apply the basis calculation and depreciation rules for Sections 1245 and 1250, as well as Section 1031. Even a REIT (Real Estate Investment Trust) can benefit from a Cost Segregation Study. While a REIT may focus on earnings and profits, attention to controlling its “peeks and spikes” for taxable income can be managed with the use of accelerated depreciation deductions. A REIT can maintain distribution requirement s, preserve capital for future investment opportunities, as well as defer ordinary income for Section 1231 capital gains with the implementation of a Cost Segregation Study. While commercial real property has a recovery period of either 39 or 27.5 years, with the use of a Cost Segregation Study a taxpayer can correctly classify (on average) approximately 20% to 35% of the total cost of construction or acquisition to 5, 7 or 15 year property. 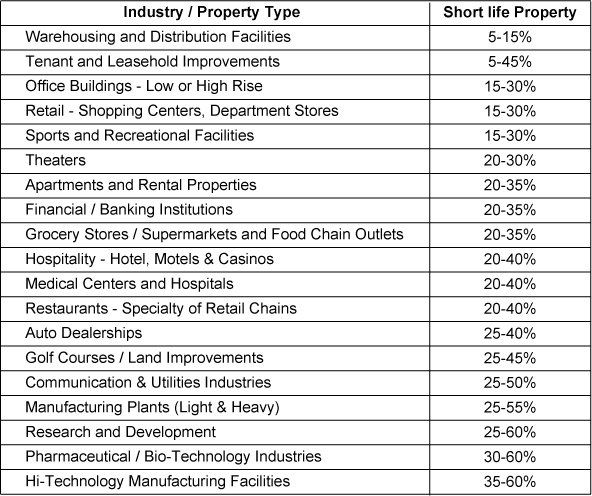 The listing below contains examples of industries with their respective potential percentage of reallocation. While the objective of a Cost Segregation Study is to maximize the available depreciation benefits for commercial property assets placed in service during the current tax year, performing a Fixed Asset Review “Retroactive Analyses” allows a taxpayer to go back and claim a one-year “catch-up” deprecation adjustment for under-depreciated or incorrectly classified assets. In general, any fixed asset with an established accounting method and placed in service after December 31st, 1986 may qualify for the automatic IRC §481(a) adjustment under Revenue Procedure 2008-52. This revenue procedure is the latest IRS authority which permits a taxpayer to elect an automatic change in accounting with respect to certain depreciation or amortization deductions. Typically, this procedure is used to modify incorrect accounting methods, such as: misclassifications of real property, general errors in accounting by the taxpayer (such as an incorrect tax life and/or depreciation method), or an incorrect ADR Classification. Additionally, by filing Form 3115 (“Application for Change in Accounting Method”) under Revenue Procedure 2008-52, this permits the taxpayer to claim the “catch-up” adjustment without having to amend any previous returns. This is especially important when considering Partnership filings. * And, meet with you to discuss the implementation, as well as the results of the study. Conducting a Fixed Asset Review “Retroactive Analyses” requires experienced personnel with backgrounds in construction engineering and tax accounting. Our team combines both of these talents and has successfully complete numerous retroactive studies since 1996 with the introduction of Revenue Procedure 96-31. Please contact a Pacific Cost Segregation specialist and request a free examination and see if you can benefit from a Fixed Asset Review “Retroactive Analyses”! While the most common time to conduct a Cost Segregation Study is during the year an asset is placed in service, a prudent investor should also consider a Pre-Construction Design Service before the start of any construction project. At Pacific Cost Segregation, our tax consultants work in conjunction with the project management team by providing a “shopping list” of assets to be isolated and tracked during construction. This list contains specific “short-life” items found in documents that we know will be readily available in the normal course of a construction project, but are buried deep within a subcontract level or invoice level. By requesting the construction team to present monthly billing packages following a customized chart of accounts (similar to the Construction Specifications Institute format, aka CSI classification), during the bid process or in the early phases of construction, this will allow our Cost Segregation team to access a greater level of cost detail. Additionally, we do understand the “in-place” rapport between the owner, their selected contractors, design professionals, and management team and thus our methodology is respectful of these relationships where by we offer suggestions and do not dictate this process. Before the start of a construction project, consulting with our Cost Segregation team can substantially decrease the overall fees of a Cost Segregation Study and insures an owner to take full advantage of the prevailing tax saving opportunities. Pre-Construction Design services are well suited for any new construction, remodel, demolition, abandonment or redevelopment project. Contact Pacific Cost Segregation and request a free analysis and determine the best timing and approach for your project.